Wes Anderson is probably my favorite director, and certainly my favorite film stylist. We all love him here at the ‘Agree; Jessica’s handprinted Max Fischer extracurricular activities pencils are probably proof enough. 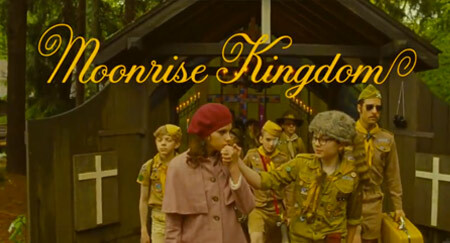 We’re very very very excited about his new movie Moonrise Kingdom. Typographically, he’s been very consistently an all-caps-Futura man. While he outlined it for The Life Aquatic, Bollywood half-opened something not-quite-Futura for The Darjeeling Limited and emboldened and threw it on a curve for Fantastic Mr. Fox, he’s established an iconic typographic style that is very recognizable. That said, I’m not at all sad that he hired the fabulous Jessica Hische to make a custom script for this one! It fits in with his aesthetic perfectly, and grants the coming of age story a wistfulness that the cold caps of Futura wouldn’t. *Note that all-caps Futura does make an appearance at least thrice in the trailer, notably on the awesome mimeographed-handwriting-practice-paper letterhead.